WYD honeymoon: Alice and Chris Williams didn’t opt for the quiet or peaceful resort getaway for their honeymoon. “We don’t remember the first time we saw each other, we don’t remember meeting, but … our faiths both led us to that youth group,” Alice said. The pair were married by Chris’ uncle, Bishop-elect Anthony Randazzo, on July 2 at the Church where they met. Since leaving Australia one week after their wedding, the couple have spent their married life praying at various pilgrimage sites in Poland, including Maximilian Kolbe’s cell at Auschwitz, visiting the Jasna Gora monastery, spending time with Catholic is Polish town Zdzieszowice, and walking with huge crowds through the streets of Krakow. “It’s been really good because it’s given us time away not just alone but among other Christian which is like life anyway – growing together and as a group of Christians,” Alice said. The couple also realised early on that being married and on pilgrimage has its limitations. “Like, we’ve been in separate beds everywhere because we were in pilgrim houses,” Alice said. “It’s been good too because we have learnt a bit more, that being together in our room is important but that’s not what marriage is. “Marriage isn’t just getting to stay in the same bed, marriage is your whole life and your pilgrimage of life together. The pilgrimage has emphasised of making God and their Catholic faith the central focus of their marriage. 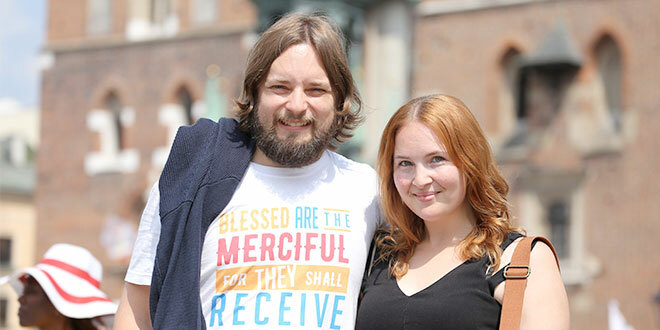 After hearing a talk by Scott and Annie Powell on marriage at a WYD Catechesis session on July 29, Alice and Chris are now praying about how their vocation will fit into God’s “bigger picture”. “Yesterday the married couple talked about when you’re trying to find a partner, you both run towards Jesus, you run towards Jesus yourself and you look to your right and see who is running with you,” Alice said. While the couple have talked about having children and buying their first home, WYD has offered a new perspective on the life of a married couple. “We have just been thinking about having babies, settling down, having a nice little home but instead (since the talk), (it’s about) where’s our vocation taking us now? “And trying to let go and work through what we’re going to be doing,” Chris said.